On 12 July 2016, the Council recommended Ireland to achieve an annual fiscal adjustment of 0.6% of GDP towards the medium-term budgetary objective in 2017. Based on the Commission 2017 spring forecast, there is a risk of a significant deviation from the recommended fiscal adjustment over 2016 and 2017 taken together. According to the commonly agreed adjustment matrix under the Stability and Growth Pact, that adjustment translates into a requirement of a nominal growth rate of net primary government expenditure which does not exceed 2.4% in 2018. It would correspond to an annual structural adjustment of 0.6 % of GDP. The expenditure benchmark reflects an adjustment to correct for a distortion to the 10-year reference rate of potential growth caused by the exceptionally high surge in real GDP growth in 2015. Following the approach taken by the Irish authorities in their Budget 2017 calculations, the Commission has taken the average of potential growth rates in 2014 and 2016. Under unchanged policies, there is a risk of some deviation from the requirement over 2017 and 2018 taken together. At the same time, Ireland is forecast to comply with the transitional debt rule in 2017 and 2018. Overall, the Council is of the opinion that further measures will be needed, notably in 2017, to comply with the provisions of the Stability and Growth Pact. In view of Ireland’s current cyclical conditions and the heightened external risks, the use of any windfall gains to further reduce the general government debt ratio would be prudent. However, as foreseen in Regulation (EC) No 1466/97, the assessment of the budgetary plans and outcomes should take account of the Member State’s budgetary balance in light of the cyclical conditions. As recalled in the Commission Communication accompanying these country-specific recommendations, the assessment of the 2018 Draft Budgetary Plan and subsequent assessment of 2018 budget outcomes will need to take due account of the goal to achieve a fiscal stance that contributes to both strengthening the ongoing recovery and ensuring the sustainability of Ireland’s public finances. In that context, the Commission intends to make use of the applicable margin of appreciation in light of the cyclical situation of Ireland. 1. Pursue its fiscal policy in line with the requirements of the preventive arm of the Stability and Growth Pact, which translates into a substantial fiscal effort for 2018. There are other recommendations but we’ll focus on that element relating to fiscal outcomes. There is lots going on in the second paragraph of the extract and there’s some familiarity with most of the words and phrases used (not that that is necessarily a good thing). One of those that defeated my personal translator comes right at the end of the paragraph: “the applicable margin of appreciation”. The Vade Mecum provides the necessary inputs for a fiscal space translator but a search of its 224 terse pages shows no mention of margins of appreciation. It seems to be akin to a legal concept that has developed from the application of the European Convention of Human Rights at the European Court of Human Rights (which of course are unrelated to the EU). In lay terms it seems to entail discretion. So as well as medium-term objectives, adjustment paths, expenditure benchmarks, transitional debt criteria and significant deviations we now have to add margins of appreciation to the mix. Does a margin of appreciation apply when there are breaches of the Stability of Growth Pact? No, we already have significant deviations for that. A significant deviation is a breach greater than 0.5 per cent of GDP. In Ireland’s case, a significant deviation would only be assessed if there was a breach of over €1.3 billion for a single year or by an average of €0.7 billion over two years. It seems a margin of appreciation will apply beyond these thresholds for a significant deviation. And if you want to see the impact of that a good place to start is the staff working document released on Tuesday on which the Commission’s above assessment is based. Below is the summary table of the staff assessment. We don’t need to go through it. The coloured cells represent the assessed outcomes. Green shows compliance, orange some deviation but not significant, with red showing significant deviations. In the table the Commission staff make ten assessments (in the columns labelled COM) based on their estimates and inputs. Of these, three are green, five are orange and two are red. The red appear in the row for the two-year assessments of the expenditure benchmark. We could go ever deeper down the rabbit hole and look at some of the factors impacting these assessments of the expenditure benchmark. Should the non-indexation of the (income) tax system be considered a discretionary revenue raising measure? [EC: No] Should one-off items of expenditure be excluded? [EC: Yes] Should the impact of the 26% growth shock in Ireland in 2015 be striped out over? [EC: Yes] And whatever you’re having yourself. The Commission can even use different answers to these questions – and they explicitly do this for non-indexation. The smattering of orange and red means an “overall assessment” needs to be carried out. In the overall assessment the Commission do consider non-indexation to be a revenue raising measure. 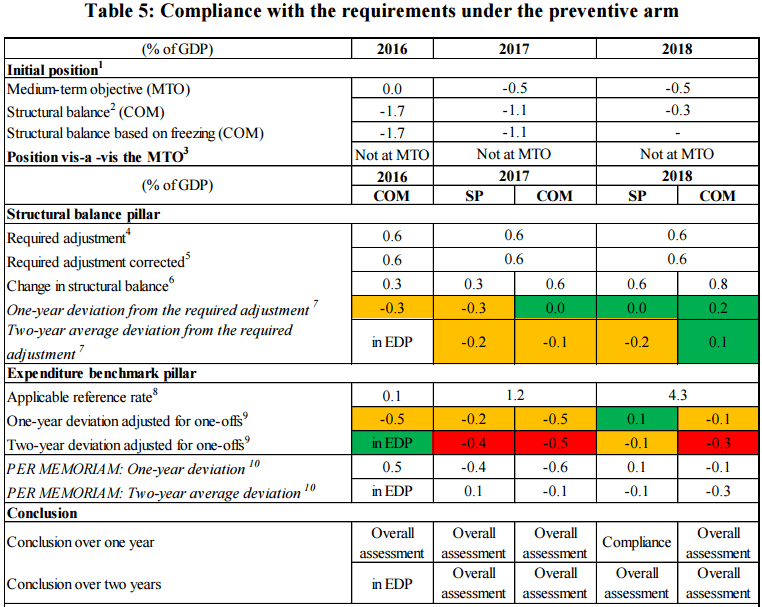 Anyway, this time last year there were a few orange cells and no red in the 2016 column and the overall assessment was that Ireland would “broadly comply” with the SGP in 2016. If we got out our translator it would tell that there was a breach, but not a significant deviation and thus not sufficient to potentially trigger sanctions. The outturns for 2016 aren’t much different to what was expected 12 months ago but now the overall assessment is that 2016 shows “some deviation” from the requirements of the SGP. We must be using a different translator this year as punching in the same numbers now gives different words. So while 2016 has “some deviation” we can see that the red cells begin to flash up for 2017. Red means a significant deviation but the overall assessment for 2017 “points to a risk of a significant deviation”. Maybe it is within the margin of appreciation but the reluctance to say it will be a significant deviation could be down to the changed treatment of one-offs. They are now excluded from the assessment of the expenditure benchmark but this decision was not formally made until December 2016 by which time countries had submitted their Draft Budgetary Plans for 2017. Excluding one-off items is sensible as they shouldn’t really trigger a breach or facilitate compliance of the expenditure benchmark. However, the key one-off in the recent assessments of Ireland relates to a 2015 transaction in which preference shares in AIB were exchanged for ordinary shares, which are perceived as riskier. In effect, this saw a financial transaction when the preference shares were acquired in 2011 become a capital injection when they were converted to ordinary shares in 2015. The expenditure benchmark didn’t apply to Ireland in 2015 (as we were in the Excessive Deficit Procedure) so the issue is not that this one-off could have triggered a breach of the expenditure benchmark. The issue is that leaving this expenditure in the 2015 base meant that the allowable expenditure in 2016 was much greater. The expenditure benchmark is a growth-based rule, so a higher base allows higher nominal spending increases for the same growth rate. Around the same time we had the surge in corporation tax and increases in other revenues which meant this extra spending space could be filled while still allowing for some improvement in the government balance. The impact of this can be seen in the rows labelled “PER MEMORIAM” which show the assessment of the expenditure benchmark without adjusting for one-offs. By doing so the breach of the expenditure benchmark over 2016 and 2017 all but disappears. The additional spending simply took the place of the AIB transaction. However, at the time of Budgets 2016 and 2017 it had not been formally decided to exclude one-offs from the expenditure benchmark (and further the regulation setting out the Expenditure Benchmark does not make reference to one-offs). Availing of the space created by the AIB transaction (and the corporation tax surge) may have gone against the spirit of the rules but not necessarily the letter of them (as understood at the time the decisions were made). Not stripping out one-offs from the expenditure benchmark, when the other pillar of the rules (the structural balance) does so seems odd and it is odd. It’s not clear why the omission occurred, but it is most likely to have been an oversight in the initial design of the rules. The one-year assessment of the expenditure benchmark in 2017 is not affected by the 2015 AIB transaction and the Commission’s staff assessments both including and excluding any one-offs that occurred in 2016 or 2017 show non-compliance with the expenditure benchmark in 2017, with possibly a significant deviation. Non-compliance with the expenditure benchmark in 2017 is not a surprise as the Budget day documents show a breach. See Table A7 on page 59. What does this mean? Given how things keep changing we must wait until the European Council makes a decision on the Commission’s recommendations in a few weeks. If we go back to the extract way back at the start of this from the Commission’s recommendations we see that nothing is actually recommended for the 2017 fiscal outturns. The message is try and do better next year. But even if a significant deviation is signalled next year the staff report tells us “[t]he Commission noted that, in carrying out its future assessments, it stands ready to use its margin of appreciation in cases where the impact of large fiscal adjustment on growth and employment is particularly significant.” What margin of appreciation do you apply to an economy growing at five per cent plus where employment is growing at three and a half per cent? Maybe we should ask why is this becoming ever more complex? Why do the words and their meaning keep changing so that we need to update our translator? Who will read and report on this stuff if almost nobody understands it? And what happened to the promises of the Juncker Commission to simplify the framework? Eighteen months later and the proposals include the addition of the expenditure benchmark to the corrective arm, the use of a plausibility tool to assess output gaps and, as we have seen here, the introduction of margins of appreciation to the preventative arm. What has been removed? Very little, though the application of some elements has improved. Smartphones have been compared to the complex handheld devices long depicted in science fiction, but what is striking is the elegance of their design by comparison. Young children can grasp the use of a smartphone given the clever heuristics and simplicity involved. The fiscal rules may still be in “beta version”, but the need to move towards greater simplicity is paramount. In particular, avoiding a bias towards obfuscation (the excessive use of latin, delayed communication of changes, updating rulebooks without emphasising important amendments, a reliance on old and competing programming software for potential output estimation…) is pivotal for the credibility of the framework. Confusing users will only alienate them and risks masking underlying weaknesses in the rules as they emerge, particularly those that introduce increasing scope for non-compliance, thus jeopardising a repeat of the pre-crisis experience. Crossed Tourmalet. Very good road. Perfectly feasible. No translator needed. OK, maybe we can’t be as pithy as that but surely we can move in that direction. The Col du Tourmalet is ontologically real. It exists. Sean Kelly has empirically proved it by riding it. Albeit macroeconomic fiction its effects are real and extremely damaging to states weaker than Germany. Worse, it has been forced into law. So, we now have economic professors, such as your good self, now spending time gathering generally realistic estimates so as to evaluate state policy based on … well … nonsense. You have my sympathy …..
… but it would be more honest and ethical to simply come out and state unequivocally that as reasonably educated academics that you simply cannot put up with such nonsense. Then you would have my respect. This state’s Citizenry needs, badly needs, investment. Such needs demands that this nonsense must end. To keep it simple, how about calculating output gap by just subtracting the unemployment rate from the long-term average. The data on everything else is problematic. The “margin of appreciation” might suitably be described as the Moscovici/Macron factor. The fundamental point is that countries cannot be coerced into following the correct budgetary policies. The forces of domestic politics are too strong. The only realistic objective for the Commission is to exercise an element of restraint. Burying the process in a sea of technical mumbo jumbo that only economists, or, at least those trained in macro-economics, can understand, does not help. But it was the member states that designed the process. With certain ulterior motives in mind!